Corporal Vercoe's grave at Underhill Farm Cemetery, Ploegsteert. In a letter to his mother, his section officer, Lieutenant G. Cecil North, declared "I have never known a man more fearless, more keen and more devoted to duty. Nothing seemed to tire him; nothing discouraged him; nothing was ever too hard for him"
Francis Vercoe was born at Adeyfield in 1889 and was the second son of James Vercoe, a carpenter at Adeyfield Farm, and Mary Louisa. His father died in 1895 and by the time of the First World War the family had moved to 25 West View Road (now part of Alexandra Road). 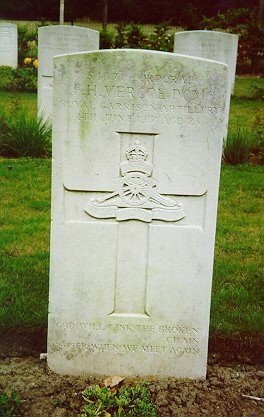 During the First World War, Corporal Francis Vercoe served with the 145th Siege Battery of the Royal Garrison Artillery and fought at the Battle of Ypres. In January 1916, Corporal Vercoe was awarded the Distinguished Conduct Medal (D.C.M.) 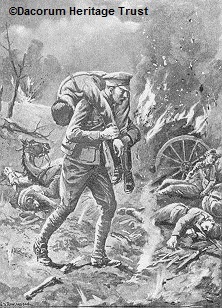 “For conspicuous gallantry and devotion to duty near Ypres on 29 December 1915, when, under heavy fire of high explosive and gas shells, he left his dug-out and went about 200 yards through a dense cloud of gas to a farm where another Battery was billeted and rendered first aid to several wounded men. While he was doing this a bursting shell blew him across the room in which he was working, but he coolly picked himself up and returned to his work”. A couple of months later, he was awarded a Dated Bar to his D.C.M. “For conspicuous gallantry. He went out with his Officer under heavy shell fire and assisted in rescuing the drivers of a wagon which had been hit by a shell, drivers and horses being wounded. He and his Officer were then wounded by a shell, the latter very severely. 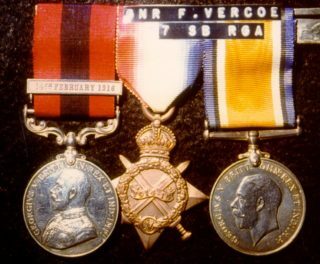 Gunner Vercoe, wounded as he was, carried him back under heavy fire and refused to have his wound attended to till he had assisted to dress those of his Officer”. Unhappily, Corporal Vercoe was killed by a shell in Belgium on 4 June 1917 whilst off duty and sitting reading outside his dug-out. He was 28 years old. #77 is a real hero and role-model for our times. Forget the media feeding the likes of stinporg figures and actors, men like Cpl Apiata derserve the plaudits and recognition. Good on you Cpl Apiata, you’re an inspiration and model of true heroism. Good to see the Poles getting the recognition they derserve too. A brave an honourable people that have been on the wrong end of history too many times, but the courage and pride never died. Dziekuje.